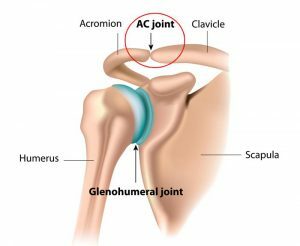 The acromioclavicular joint (AC Joint) lies between the outer end of the collar bone (clavicle) and the acromion (part of the shoulder blade). Near where a bra strap would go. There are 2 common problems encountered with the AC Joint; pain and instability. This is a common problem. It is particularly noticeable when doing overhead activities such as decorating a ceiling, high pruning, bench and shoulder pressing, freestyle swimming, or when reaching across your body such as applying deodorant or reaching for the seatbelt. It may also be painful to lie on at night. Osteoarthritis of the acromioclavicular joint. This is very common and on xray almost everyone over the age of 40 has some evidence of this condition. Meniscal injury. Just as in the knee this little joint has a small meniscus within it which can be damaged by injury. This causes pain and clicking. Treatment usually starts with activity modification, rest, painkillers and anti-inflammatory drugs. If it doesn’t settle quite quickly then physiotherapy can sometimes be of benefit. If all that fails then cortisone injection into the AC joint can be very effective. However if the injection helped for a while (confirming the source of the pain) but subsequently wears off, then the last resort might be an excision of the acromioclavicular joint. This can be performed either arthroscopically or by an open operation. There are pros and cons to both which can be discussed with your surgeon. Read more about the open AC joint excision operation here. The post-operative physiotherapy protocol can be found here. Harry has performed 208 open AC joint excision operations. The AC Joint can be dislocated/subluxed/sprung/separated during an injury. This occurs when falling heavily onto the point of the shoulder without having had a chance to put your arm out to break the fall. This is seen most commonly in cyclists who are clipped in, rugby players, skiers or anyone falling very quickly. The acromioclavicular joint is very tender and may even look very prominent. It is a really painful injury in the acute phase. A simple xray will usually be enough to confirm the diagnosis although occasionally an MRI can be helpful to guide treatment. The degree of separation of the two bone ends help to define the classification of injury. Treatment starts with rest in a sling and good strong painkillers. There is no sling which is better than any other. No sling or orthotic can alter the fact that your AC joint is now dislocated and will remain so permanently unless you have an operation. There has never been a good clinical study to help guide the management of these common and painful injuries. By and large the world is divided. Most of Europe and Australia favour a non operative approach with the expectation that in the majority of cases the pain settles and full function returns without the need for an operation. In the USA there is a tendency towards early surgical intervention. Grade 1 injuries. These are really painful but do not require surgery. If the pain does not settle then a cortisone injection can be very beneficial. Grade 2 injuries. The pain usually settles over the course of a month or two. If not a cortisone injection can be helpful. If the injection does not provide longterm relief then an MRI is required to ensure that the coraco-clavicular ligaments are definitely intact. If confirmed then surgical treatment can be a simple distal clavicle excision. Grade 3 injuries. This is where the jury is out. By 3 months after injury about 90% of people will have no pain, full strength and movement but with a permanent visible bump. Yet 10% continue to suffer with symptoms which might include pain, lack of power, a sense of disconnectedness with the arm, or loss of confidence. When all this is described most people choose to wait and see but some would rather not and therefore opt for early surgery. 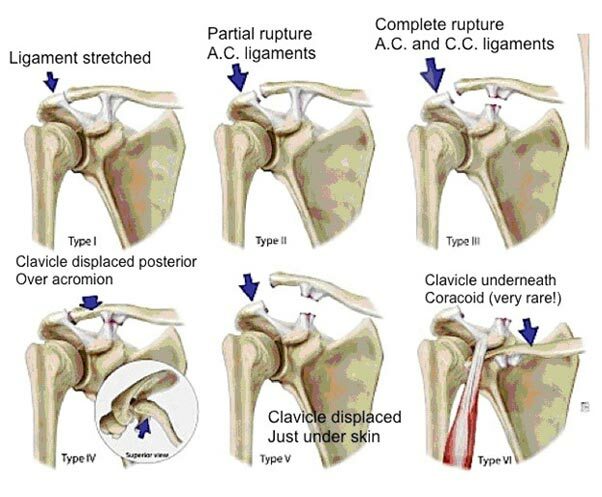 I prefer to perform the same operation whether in the early or late stages namely an acromioclavicular joint stabilisation using a synthetic ligament (see below). Grade 5 injuries. Most surgeons agree to progress to surgery early as the failure of non operative treatment at 3 months is much higher. However there is still no harm in waiting if you prefer not to embark on surgery. Other grades. There are all very rare and would need to be considered on an individual basis. This is performed as daycase or inpatient surgery under general anaesthetic. A cut is made over the top of the shoulder and the final 1cm of the collar bone is cut off. A length of synthetic braided material is looped around the coracoid (boney prominence of the shoulder blade) where it acts as an anchor point. The material is pulled hard over the top of the collar bone to force it down into position and then fixed into the collar bone with one metal screw. You can watch animation of the operation below. Read more general information about AC Joint stabilisation surgery here. To read more specific details about Lockdown (previously known as Surgilig) follow this link. Harry has performed 100 stabilisations of the AC joint.